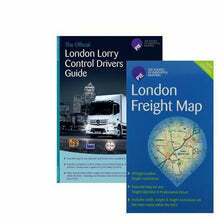 The London Freight Map for transport managers and haulage companies who operate in London. This is a laminated wall map. Enables compliant route planning to the London Councils London Lorry Control Scheme (Lorry Ban). Includes TWO Wall Maps at an overall 15% discount. The 'Wall Map' measures 137cm by 98cm.